From the 21St to the 24th of March 2017 will take place International Specialized Exhibition "Healthcare of Belarus 2017". Location: Minsk, Pobediteley Avenue 20/2 (football arena). 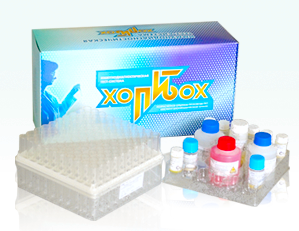 The kit is intended for evaluation of free thyroxine (T4) concentration in blood sarum of human beings by means of enzyme-linked immunosorbent assay. Evaluation of the free thyroxine (T4) level in blood is an important indicator of the thyroid gland functioning free thyroxine (T4) level is reduced in case of hypothereosis while hyperthereosis is accompanied by its higher concentration. The kit is designed for analysis in duplicates of 41 unknown samples, 1 control sample and 6 calibrators - total 96 evaluations. The EIA-TSH kit is intended for evaluation of thyreotropin quantity in blood sarum of human beings by means of enzyme-linked immunosorbent assay. Evaluation of the TSH level in blood serum has diagnostic importance during evaluation of thyroid status of organism. Thyreotropin is released by the anterior pituitory gland, and it stimulates synthesis of triiodothyranine and thyroxin in thyroid gland. The EIA-TSH kit is designed for analysis in duplicates of 40 unknown samples, 1 control sample and 7 calibrators - total 96 evaluations. The EIA-thyroperoxidase antibodies kit is intended for evaluation of thyroperoxidase in blood serum of human beings by means of enzyme-linked immunosorbent assay. Evaluation of the thyroperoxidase antibodies is a diagnostic marker of chronic lymphocyte thyroiditis (Hashimoto disease), and they are highly concentrated in blood serum (90-100)% of patients having this diagnosis. Besides, determination of thyroperoxidase antibodies in blood serum of human beings may be used for diagnostics of postpartum (hidden) autoimmune thyroiditis, granulomatous thyroiditis and diffuse goiter. The EIA-thyroperoxidase antibodies kit is designed for analysis in duplicates of 42 unknown samples, 1 control sample and 5 calibrators - total 96 evaluations. The EIA-anti-thyroglobulin kit is intended for evaluation of thyroglobulin antibodies in blood serum of human beings by means of enzyme-linked immunosorbent assay. Evaluation of the thyroglobulin antibodies in blood is required for diagnostics of violations in the hypothflamic-hypophysial-adrenal cortex axis. The EIA-anti-thyroglobulin kit is designed for analysis in duplicates of 41 unknown samples, 1 control samole and 6 calibrators - total 96 evaluations. The EIA-ferritin kit is intended for evaluation of ferritin blood serum of human beings by means of enzyme-linked immunosorbent assay. Evaluation of the ferretin level in blood has the diagnostic value for assessment of iron-deficient states of a number of oncological diseases. The EIA-ferretin kit is designed for analysis induplicates of 41 unknown samples, 1 control samole and 6 calibrators - total 96 evaluations. The quantity of reagents is intended for 3 times by 4 strips. The EIA-TESTOSTERONE kit is intended for evaluation of testosterone quantity in blood serum of human beings by means of enzyme-linked immunosorbent assay. Evaluation of the testosterone level in blood has diagnostic importance during evaluation of reproductive system functioning. The EIA-TESTOSTERONE kit is designed for analysis in duplicates of 41 unknown samples, 1 control samole and 6 calibrators - total 96 evaluations. The EIA-PROGESTERONE kit is intended forevaluation of progesterone quantity in blood serum of human beings by means of enzyme-linked immunosorbent assay. Evaluation of the progesterone level in blood has diagnostic importance during evaluation of reproductive system functioning. The EIA-PROGESTERONE kit is designed for analysis in duplicates of 41 unknown samples, 1 control sample and 6 calibrators - total 96 evaluations. The EIA-ESTRADIOL kit is intended for evaluation of estradiol quantity in blood serum of human beings by means of enzyme-linked immunosorbent assay. Evaluation of the blood has diagnostic impotrance during evaluation of reproductive system functioning. The EIA-ESTRADIOL kit is designed for analysis in duplicates 41 unknown samples, 1 control sample and 6 calibrators - total 96 evaluations. The EIA-CORTISOL kit is intended for evaluation of cortisol quantity in blood serum of human beings by means of enzyme-linked immunosorbent assay. Evaluation of the cortisol level in blood is required for diagnostics of violations in the hypothflamic-hypophysial-adrenal cortex axis and control of effectiveness of performed remidial measures. The EIA-CORTISOL kit is designed for analysis in duplicates of 41 unknown samples, 1 control sample and 6 calibrators - total 96 evaluations. The EIA-Microalbumin kit is intended for evaluation of albumin in urine of human beings by means of enzyme-linked immunosorbent assay. Evaluation of the albumin level in blood has the diagnostic, clinical and prognostic value for detection of early stages of kidney damage of patients having cardiovascular deseases and diabetes. Albumin is a marker of endothelial dysfunction and predictor of unfavarouble prognosis of disesases of this category of patients. Microalbumiuremia is evaluated with protein contens in urine 20-200 mg/min or 30-300 mg/day. The EIA-Microalbumin kit is designed for analysis in duplicates of 40 unknown samples and 1 control sample with the simultaneous use of all strips - total 96 evaluations. The EIA-PSA kit is intended for evaluation of specific antigen concentration of prostatic gland (PSA) in blood serum of human beings by means of enzyme-linked immunosorbent assay with the use of monoclonal antibodies. High PSA concentration (10- ng/ml) is typical for malignant prostatic tissues. PSA concentration considerably increases in patients with metastases in bones. PSA level evaluation is required during follow-up of patients during treatment and remission. Sensitivity of invaded prostatic tissue to radiation therapy, chemotherapy and hormonal treatment may be evaluated by changing the PSA concentration. However, data on PSA concentration should always be interpreted by taking into account other clinical data. The EIA-PSA-free kit is intended for evaluation of specific antigen concentration of prostatic gland (free PSA) in blood serum of human beings by means of enzyme-linked immunosorbent assay with the use of monoclonal antibodies. With the use of immunochemical test systems for evaluation of free and total PSA aange of studies showed that free PSA represented far less share in patients with untreated prostate cancer as compared with patients having benign prostate hyperplasia. Therefore, it is recommended that the quotient of free PSA to total PSA should be used as the differential diagnostic criterion between prostate cancer and benign prostate hyperplasia. The EIA-PSA-free kit is designed for analysis in duplicates of 41 unknown samples, 1 control sample and 6 calibrators - total 96 evaluations. The EIA-free beta CGH kit is intended for evaluation of free beta-subunit of chorionic gonadotropic hormone of human beings in blood serum by means of enzyme-linked immunosorbent assay. Free beta-CGH in blood serum is used for monitoring of pregnancy, prenatal screening during the first trimester aimed at detection of high risk pregnancy with inborn fetus diseases (syndrome Down, syndrome Edward), diagnostics and monitoring of some oncological diseases. Determination of free beta-CGH concentration along with PPAP-A concentration (associated with pregnancy plasma protein-A), age of pregnant women and results of ultrasonic testing may be used for evaluation of the risk of on-born fetus anomalies. Free beta-CGH kit is designed for analysis in duplicates of 40 unknown samples, 6 calibration samples and 2 control samples in duplicates - total 96 evaluations. The EIA-PPAB-A kit is intended for evaluation of concentration of protein A plasma associated with pregnancy (PPAB-A) in blood serum of human beings by means of enzyme-linked immunosorbent assay. Evaluation of PPAB-A in blood serum is used for monitoring of pregnancy, prenatal screening during the first trimester aimed at detection of high risk pregnancy with inborn fetus diseases (Syndrome Down, syndrome Edward). PPAB-A evaluation during the first trimester of pregnancy may be used as abiochemical test along with evaluation of free beta-subunit concentration of choriogonotropic hormone and results of ultrasonic testing during prenatal detection of high risk pregnancy. The EIA-PPAB-A kit is designed for analysis in duplicates of 40 unknown samples, 6 calibration samples and 1 control sample - total 96 evaluations.